Denver once had an extensive electric rail transit system that included over 250 miles of city tracks and 40 miles of high-speed interurbans connecting Denver with Golden and Boulder. Thousands of riders used the system for accessing downtown Denver and its venues, for shopping, going to work and school, seeing friends, and for recreation. With the arrival and proliferation of the automobile and a new bus system, all trolley service was abandoned in 1950. The Denver Trolley™ (formerly Platte Valley Trolley™) is a small part of that rail transit system, restored and preserved for the future for all to enjoy. We are crafting a definitive history of the Denver Trolley™, and we’ll make a post in our news blog when this is done. If you subscribe to our news feed using the feed button on the right side of this page, your Web browser or feed reader will be notified as soon as the news comes out! RTD’s West Corridor light rail expansion to Lakewood and Golden uses the same route as our Trolley’s old Route 84. Here are photos of the Trolley as it traveled along the former Route 84. Purchased by the Rocky Mountain Railroad Club to save it from destruction, Car No. 25 is the last remaining, completely intact, electric railway car out of over 250 that once served the Denver area. 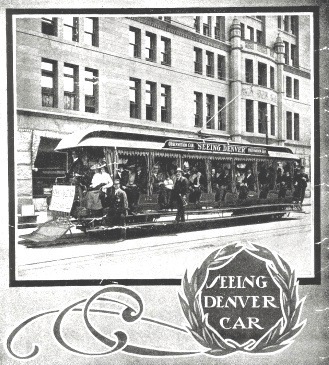 It was built in 1911 by Denver’s own Woeber Carriage Company and operated on the Denver & Inter-Mountain’s 13-mile Denver–Lakewood–Golden line from 1911 to 1950. In 2010, the Rocky Mountain Railroad Club sold Car No. 25 to the West Corridor Rail Historical Cooperative, a nonprofit partnership between the City of Lakewood and the Denver Heritage Rail Society. Car No. 25 is listed on the State Register of Historic Properties and is a rare survivor out of many thousands of intercity interurban cars that once served this country.